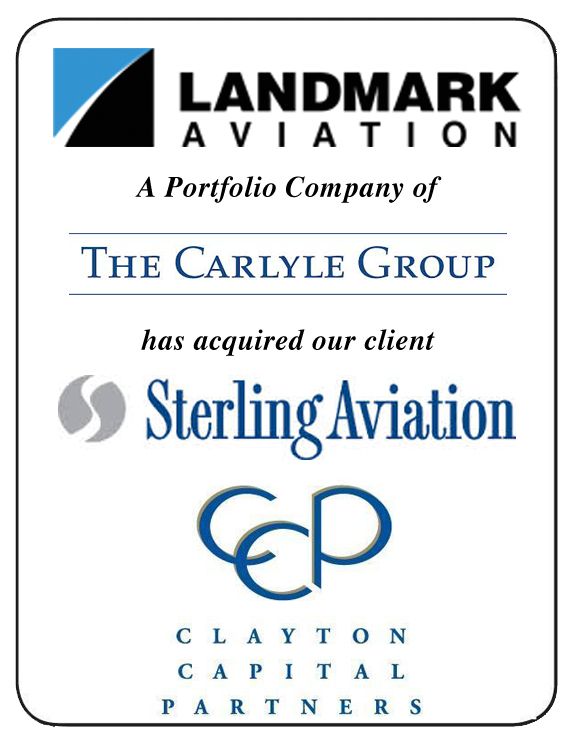 Clayton Capital Partners is pleased to announce the sale of its client, Sterling Aviation Holdings, Inc., to Landmark Aviation, a Portfolio Company of The Carlyle Group. Sterling Aviation Holdings, Inc. (www.sterlingaviation.com), based in Milwaukee, WI, is a privately held, full-service corporate aviation firm specializing in aircraft management, air charter, aircraft maintenance, and acquisition support of aircraft for private air travel. Landmark Aviation (www.landmarkaviation.com) based in Houston, TX, offers a wide range of services, including, FBO, MRO, aircraft management and charter with 53 locations in the U.S., Canada and Western Europe. The Carlyle Group (www.carlyle.com) is a global alternative asset manager with more than $189 billion in assets under management across 118 funds and 106 fund of funds vehicles.